What is tumbled sea glass? What is tumbled BEACH or SEA glass. 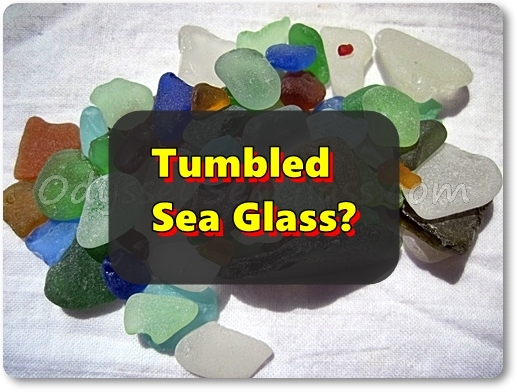 What are the differences between tumbled glass and tumbled beach or sea glass? Why there is a need for truth in advertising regarding tumbled sea glass. 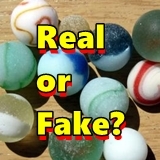 Is fake or tumbled beach or sea glass all bad? 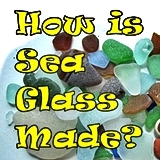 What are the differences between man-made tumbled sea glass and naturally-tumbled sea glass? Glass tumbled in a tumbler usually still has corners and edges visible, although softened. The patina of the tumbled surface is generally pretty smooth, or less "frosted" looking in mechanically-produced tumbled glass. Sea or beach glass that's of good quality, on the other hand, has very rounded edges, no corners, and a much frostier look. The facets of the frosted surface of wave-tumbled sea glass reflect light in a distinctive way, causing more of a "glow" than is found in mechanically-tumbled glass. Once you have collected genuine tumbled sea glass yourself for a time, you will be quick to see the differences between the two. The best way to avoid scams is to buy from someone well-known in the relatively-small sea glass world. Ask around on social media for recommendations before buying. Is there a real need for truthful advertising of man-made sea glass? What would you think if you were to buy a sterling silver necklace or a gold watch and then found out - it wasn't made of silver or gold but was made with some much cheaper and common metal? As with many other valuable products, false advertising has been around since the early days of man's history. That doesn't make it right! There is a need for making a distinction between real surf-tumbled sea glass or beach glass and man-made tumbled glass. The unfortunate truth is that sellers are misleading buyers by selling them what is called sea glass but is really imitation or fake sea glass - much lower quality and value. A good grade of real, genuine, pure sea or beach glass, like gold or silver, is much more beautiful and costly than its imitators. Don't be fooled by the false advertiser selling "sea glass" or "beach glass." 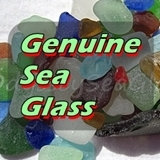 Check the pages of this site to see and understand what real sea glass is like. 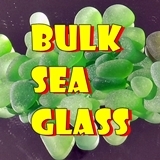 See "What Is Sea Glass," "Sea Glass Color," and "Grading Sea Glass" for helpful information. Does this mean that faux or imitation sea glass is good for nothing and a scam? 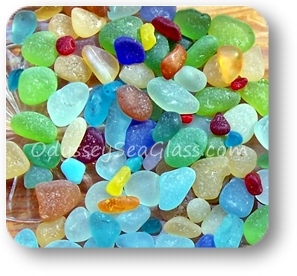 Tumbled sea glass or faux sea glass can be useful in a variety of imitation sea glass or beach glass crafts. Real sea glass does take a lot of time to collect (more valuable) and some projects require a lot of glass or a large number of unusual matching colors - a need that can only be filled by faux (artificial) sea glass. Another thing is that there are quite a few folks that just don't have ready access to genuine sea glass or they can't afford to pay for a lot of pure sea glass. Tumbled or faux sea glass fills these needs perfectly well. Why do some folks give tumbled or faux (artificial) sea glass a bad rap? Where tumbled sea glass gets a bad name is from unscrupulous people passing off artificially-tumbled sea glass as genuine sea glass - as the real thing. They lead you to believe their product is made with 100% real sea glass when in fact it's just an imitation. This is especially important when it comes to rare and unusual colors and/or sea glass jewelry. Real sea glass jewelry made with a high grade of sea glass and rare colors can cost quite a bit of money. Selling jewelry using fake sea glass that costs a nickel a piece is just plain taking advantage of people. To sum it all up, advertisers need to clearly label their imitation sea glass as imitation, man-made, faux, or other terms that clearly tell you, the consumer, what you are getting!